Tell Us About It! form to submit your suggestion. Mary Cummings Park: Adjacent to Quail Run, Mary Cummings Park comprises over two hundred acres of public park given in trust to keep the land “forever open as a public pleasure ground.” There are walking trails and a model airplane landing field! 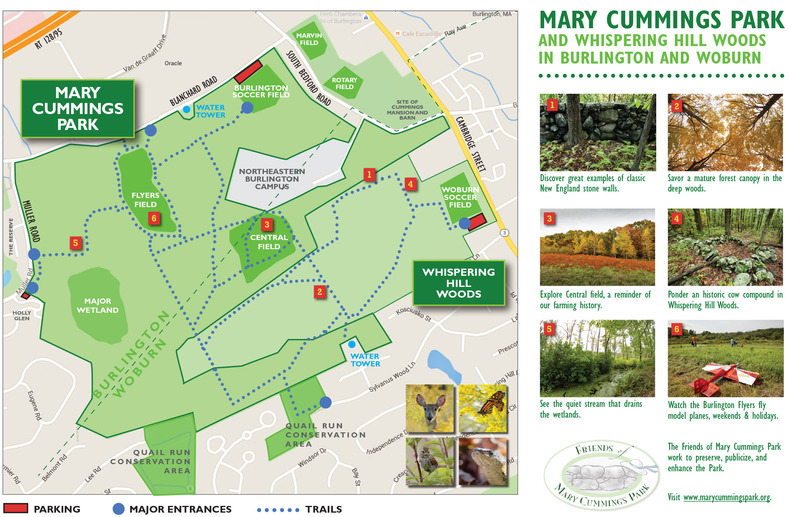 Click here to open a map of the park. Lexington is not only a convenient place to pick up the Minuteman Bikeway but also has numerous conservation lands with walking trails. Close to Quail Run is Willard’s Woods, which allows off-leash dog walking through woods and open fields. The Minute man Bikeway is ten miles long, runs from Alewife Station to Bedford and passes through historic Bedford, Lexington, Arlington, and Cambridge. The terrain is rolling, the surface paved with asphalt, and it is plowed in the winter. Bicycling, walking, jogging, in-line skating, cross-country skiing is welcomed and no motorized vehicles are allowed. The distinctive Richardson design of the Woburn Library, built in 1879. Designed by the famed architect H. H. Richardson, the Woburn Public Library is a registered national landmark. It is part of the vast Minuteman Library system, drawing from libraries surrounding the Boston area, and offers classes, activities and events for adults and children throughout the year. Also participating in the Minuteman system, the Cary Memorial Library in Lexington offers meeting and study rooms; classes, readings, and events; museum passes; book groups; and programs for teens, kids, and adults. Thinking of taking a class? Lexington Community Education is part of the Lexington Public Schools, providing classes and activities at reasonable cost for children and adults. You don’t need to be a Lexington resident to enroll in our classes. Courses include business and finance, computers, cooking, exercise and dance, music performance, writing, and much more. With campuses in Lowell and nearby Bedford, Middlesex Community College offers a wealth of credit and non-credit day, evening, online, and Saturday classes and programs. Click here to learn more about MCC’s Adult Learning program. Click here for a list of courses and programs. Not all the artwork is inside the Peabody Essex Museum. With “Stickwork” Patrick Dougherty weaves and flexes saplings into architectural sculptures. On exhibit until December 2016. Twenty miles away in Salem, The Peabody-Essex Museum is one of the Boston area’s finest museums and offers outstanding works primarily from the 1700s to today, including African, American, Asian, maritime, Native American and Oceanic art, paintings, sculptures, photographs, drawings, textiles, architecture and decorative objects. Formerly known as the National Heritage Museum, the Scottish Rite Masonic Museum & Library in Lexington specializes in small, well-curated exhibits of Americana—toys, the changing world of women in America, clocks, model railroads, lecture series on the use of maps and mapping in history and historiography, and, of course, Masonic memorabilia. Nearby Horn Pond in Woburn has extensive walking trails, good fishing, and excellent birding opportunities. Dogs have to be on leash. If you’re looking for a convenient place to exercise, swim, take yoga, or learn about wellness and healthy living programs, the North Suburban YMCA is a well-equipped facility, only a mile down the hill from Quail Run. Woburn Senior Center provides information on nutrition, health screening, education, transportation, peer support, and recreation, volunteer development. Senior Transportation Services offers discounts on taxis, van service, and discount information. Woburn Patch offers updates about news, activities, and events in Woburn. Woburn Maps has street, ward, zoning, assessor’s, and historical maps of Woburn. City of Woburn: Everything you need to know about your fair city.